Friends of the Earth International, the world’s largest federation of grassroots environmental groups, is demanding the immediate release of Friends of the Earth Ukraine member Vadim Shebanov and other activists arrested and detained by the police during a peaceful protest in the city of Dnipropetrovsk on January 26. Mr Shebanov, who is a well-known activist and former deputy of the Dnipropetrovsk city council, was engaged in an effort to try and open negotiations between local authorities and protesters gathered in the city centre. 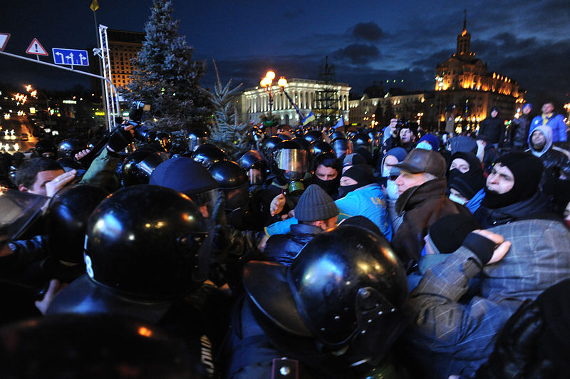 We condemn the recent abhorrent violence in Ukraine and call on all parties to pressure Ukraine to end the violence, allow investigations into allegations of police abuse, and repeal its new anti-democratic laws. We strongly urge the Ukrainian government to fully reverse recent anti-democratic national legislation adopted on January 16 that effectively criminalizes political, civil and social activities. Of particular concern are bans on public assembly, restrictions on information sharing and repressive regulations governing the activities of non-governmental organizations. Far from posing a threat to society, these activities help to develop community life, build peace and protect the free and frank exchange of ideas. We are alarmed by the potential impact of the new legislation on the entirely peaceful activities of Friends of the Earth (FoE) Ukraine / Зелений світ. FoE Ukraine is a vibrant and extremely active member of both the international federation Friends of the Earth International and the regional network Friends of the Earth Europe. FoE Ukraine’s transnational cooperation is a vital part of its work to raise environmental awareness in Ukraine and contribute to regional and international solutions to shared environmental problems. Placing legal obstacles in the way of NGOs, such as FoE Ukraine, in the name of security is a dishonest affront to the very idea of international solidarity – a cornerstone of the architecture of a peaceful global community. Environmental issues do not, by their nature, respect national borders. This work necessarily involves international cooperation. The recent legislative moves by the Ukrainian government can only damage international cooperation through myopic, reactionary national measures. Further, this raft of legislation will suffocate online and offline media and academic discourse, encourage xenophobia, and subject civil society activity in all its forms to the scrutiny of public officials: history is littered with illustrative examples of how such government interference in public life cripples innovative, creative and progressive work across education, business, civil and cultural life. We demand that the international community works swiftly to pressure Ukraine to end the violence, allow investigations into documented abuses by the police to date and repeal anti-democratic legislation, using all available diplomatic channels.